Born into a zamindar family from Madras in 1917, she was married off to another zamindar Apparao Bahadur of Vayyur. While still married, she fell in love with Maharaja Pratap Singh Gaekwar of Baroda at the 1943 Madras Horse Show. They fought legal battles with the British authorities over bigamy, and eventually set up a palatial mansion in Monte Carlo. She and her son Princie were granted honorary citizenship by Prince Rainier. Once she was made the official treasurer of the Baroda jewels, her spending spree began. 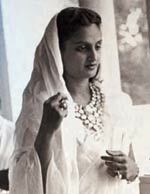 She took pride in patronising jewelery brands like Cartier, Harry Winston, Van Cleef & Arpels and Graff. Even as she hobnobbed with socialites like Marylyn Monroe and Jacquiline Kennedy, she remained draped in chiffon saris. The French factory Saree & Co. was started in her honour and shut down after her death in 1989. Are you ready for bubble tea?